Dutch studio MVRDV has converted a former overpass into a plant-covered walkway in Seoul, South Korea. In the centre of South Korea’s capital Seoul, a megacity of some 10 million people (25 if you count the surrounding capital region), a new elevated public park has opened which many are labelling as Seoul’s answer to the High Line. 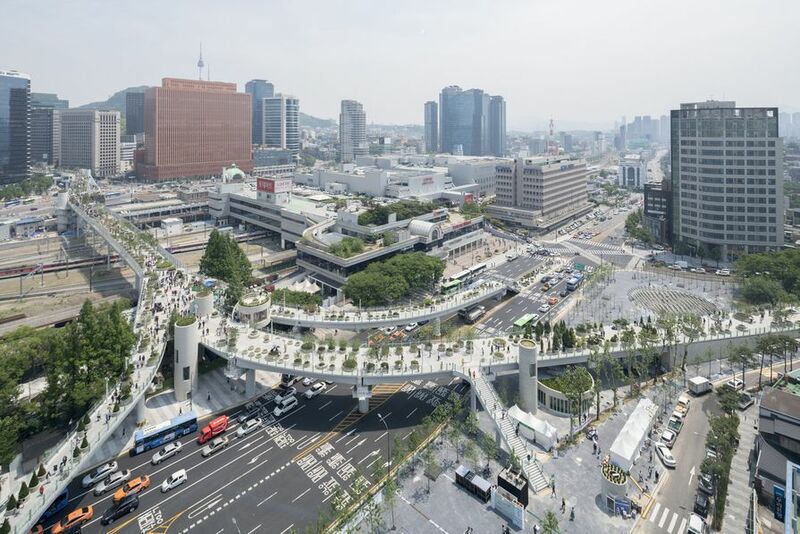 Designed by Dutch architects MVRDV, the “sky garden” is built upon a disused highway overpass adjacent to Seoul’s central railway station. Its name, Seoullo 7017, translates to “Seoul Street 7017,” with the number a nod to the highway’s foundation in 1970 and its rebirth in 2017. 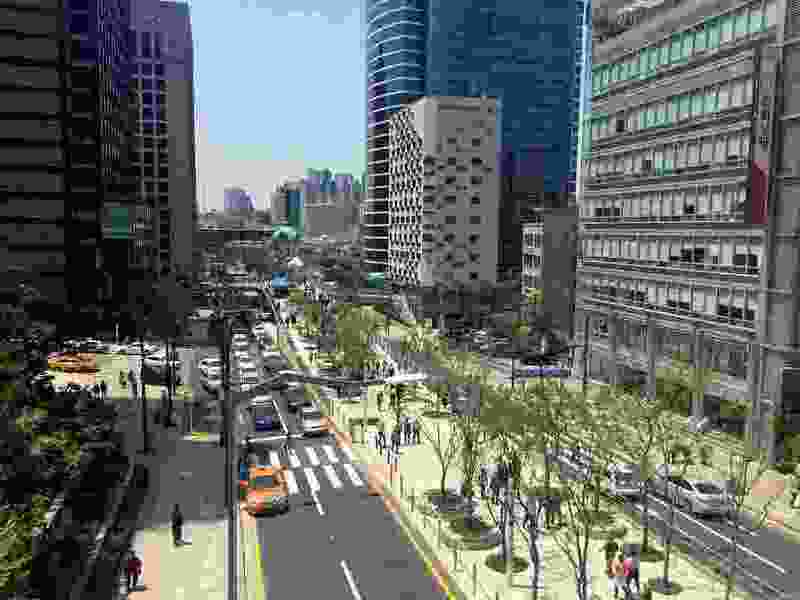 From an urban design point of view, this project does many laudable things: it repurposes a redundant vehicular overpass into a pedestrian spine; it provides very useful connections to the city’s main railway station from both the Jungnim-Dong district in the west and the Hoehyeon-Dong district in the east; and it kickstarts the revitalisation of Seoul’s core, which is tired, ugly and divided by over-scaled roadways and the railway. 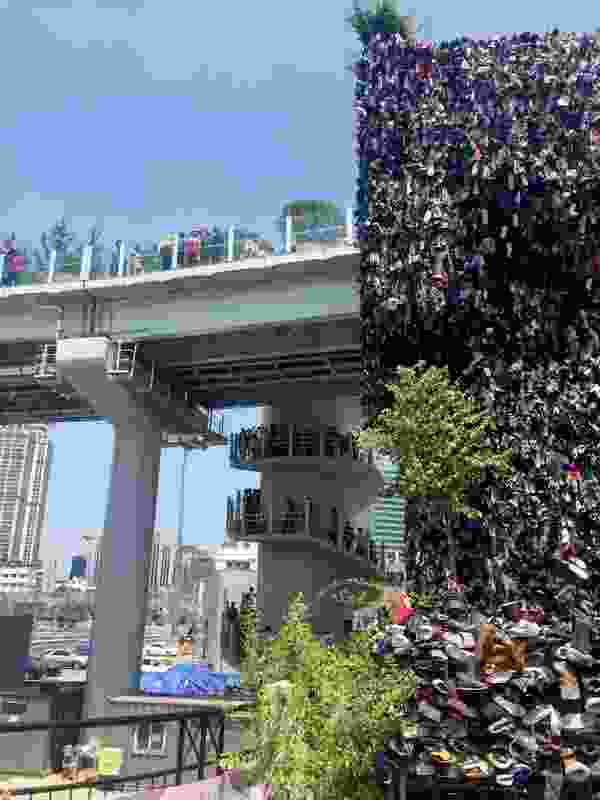 It sends a strong message to visitors about Seoul’s progressive approach to urban policy, building on its reputation as a dynamic, high-tech city. But what of the design? I had seen MVRDV’s dreamy pink and green renders adorning the windows of city buses, metro stations and construction hoardings all over town prior to visiting, and my excitement was genuinely high. 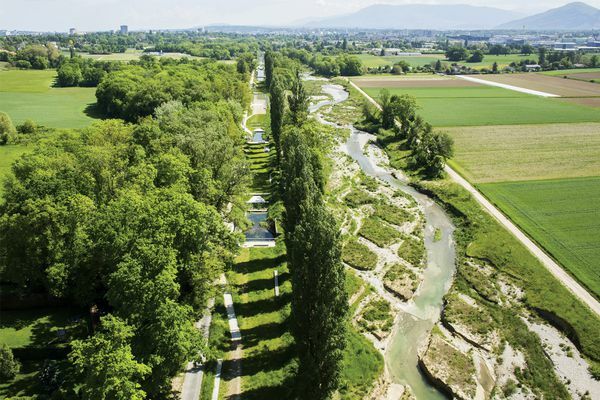 According to the designer’s website, the linear park was designed as a collection of small gardens, each one with its very own composition, perfume, colour and identity. But really, if you boil it down, the design can be summarized in one word: circles. Circles and cylinders dominate. Six hundred and forty-five cylindrical concrete planters host the so-called “plant library” of 228 plant species and sub-species. 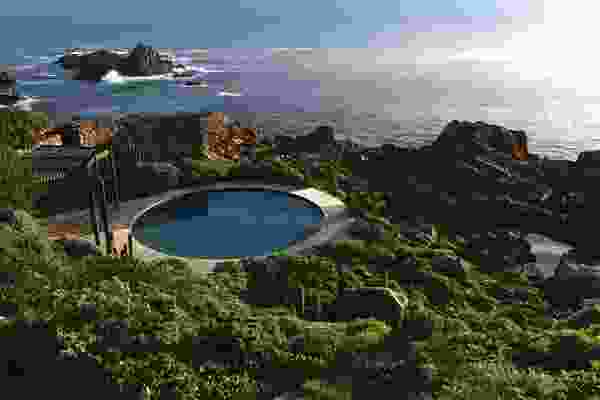 There are cylindrical shops, spiral stairwells, circular viewing platforms, lighting poles, seats, trampolines, cooling stations and even splash pools along the route. There are almost no departures from the circular language apart from the glass balustrades. It would have been such a breeze to document! 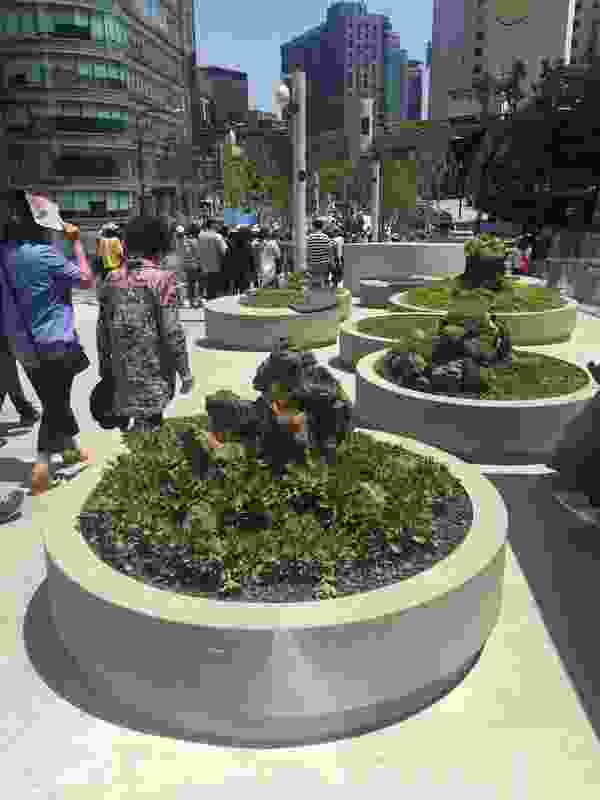 Planters are typically planted with a single plant species or tree and groundcover combination, such as here. While it’s easy to conclude a process of “shape throwing” went on here, the cylindrical tree pots do seem to have a cultural connection to the city. 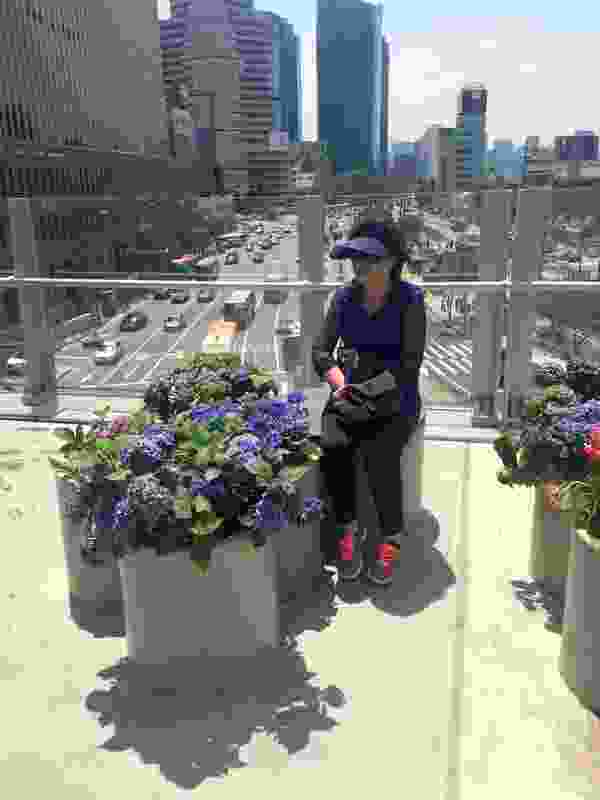 In the week preceding Seoullo’s opening I had walked around Seoul extensively and observed the city’s love affair with potted plants in public spaces. 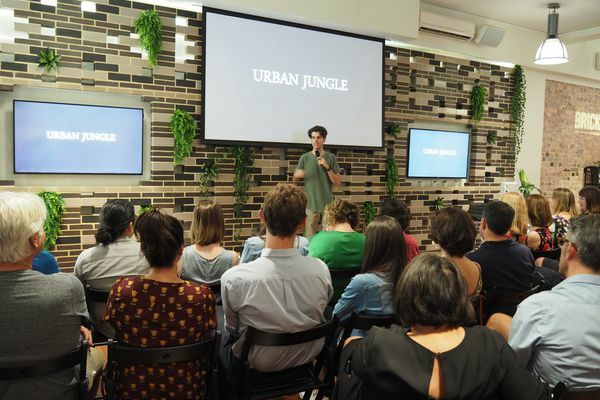 In the tiny laneways and larger thoroughfares, there are all manner of potted plants generously positioned for public enjoyment, from staked tomato plants to bamboo and ornamental grasses. The design of Seoullo does appear to respond to this rather charming local practice. However, the response is simplistic: the culture or practice identified, reduced to a formal gesture, and then rolled out en masse. On the day I visited (only one day after the ribbon was cut), the place was so packed that I had to queue to get in. 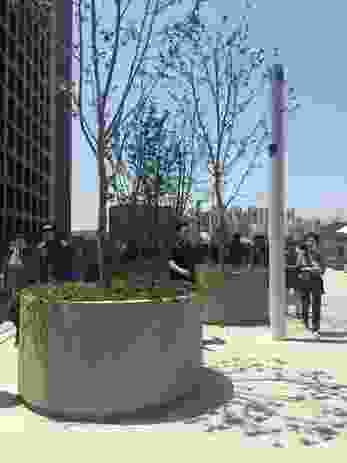 The park was pumping with music and thousands of excited visitors walking around with their cameras, selfie sticks and sun umbrellas, many posing for photos with the plants that best matched their outfits. 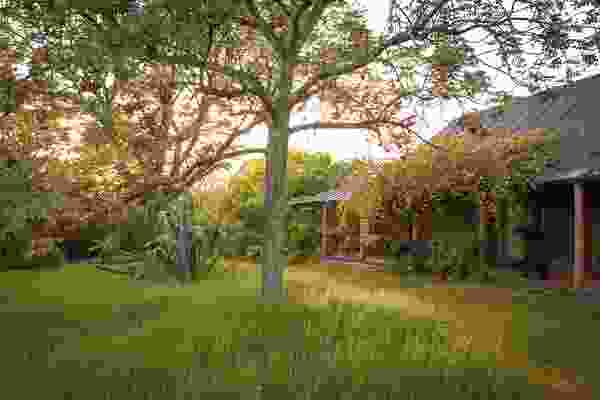 After walking about fifty metres the design becomes monotonous and predictable, and there is not yet a lot of shade or shelter from the blazing sun. The planting design was restricted to either one species per planter, or combinations of a tree planted with smaller plants at the base, such as prostate ivy, in order for the collection to be read as a “library.” Some included arrangements of rocks and moss. Unlike at the High Line, there is no clever interplay between planting, paving and seating here, all are kept so separate that the place resembles a temporary pop-up garden, albeit an enormous one, ready to be packed away for traffic to resume on Monday morning. A lady poses next to blue hydrangeas. As I post a photo of a lady in blue sitting cutely beside a blue-flowered hydrangea to my Instagram, I can’t escape the feeling that I am an unwilling participant in a giant marketing stunt, adding to a tally of key measurables somewhere, rather than witnessing the opening of a project that will advance the adaptive reuse discourse. In speaking to some local architects and landscape architects, they lamented the fact that many of the city’s signature urban projects are continually awarded to large European or American firms based on their greater experience, denying the growth and maturing of the South Korean profession. It’s a shame given the strong work being realized by South Korean architects and landscape architects, work characterized by a deep interest in and understanding of materials (such an interest is not on display here). Given its urban design fundamentals and position in the heart of a megacity, Seoullo 7017 is likely to be very well used. But as to whether it will be well liked by the Seoul population, we’ll have to wait and see how it matures. 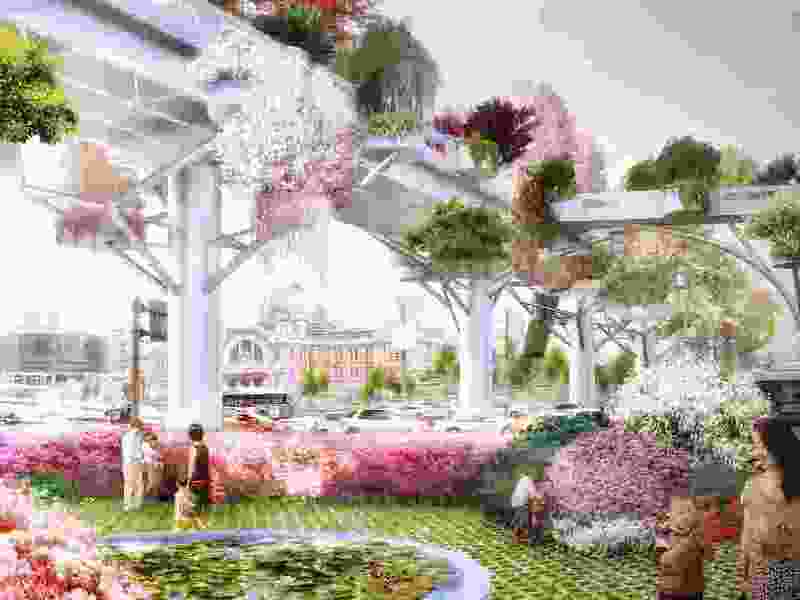 A render of MVRDV’s “sky garden” scheme. 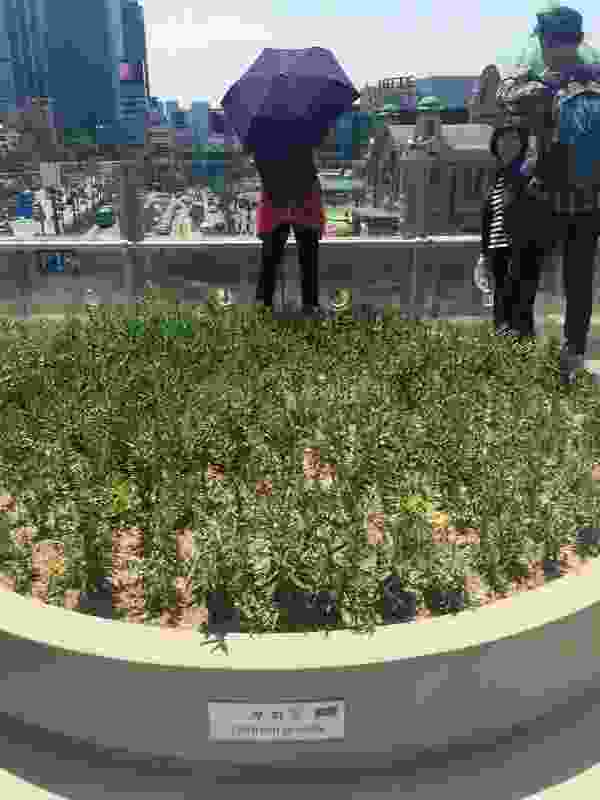 Looking down on one end of the Seoullo 7017 sky garden by MVRDV. Visitors faced long lines to enter the park on opening weekend. 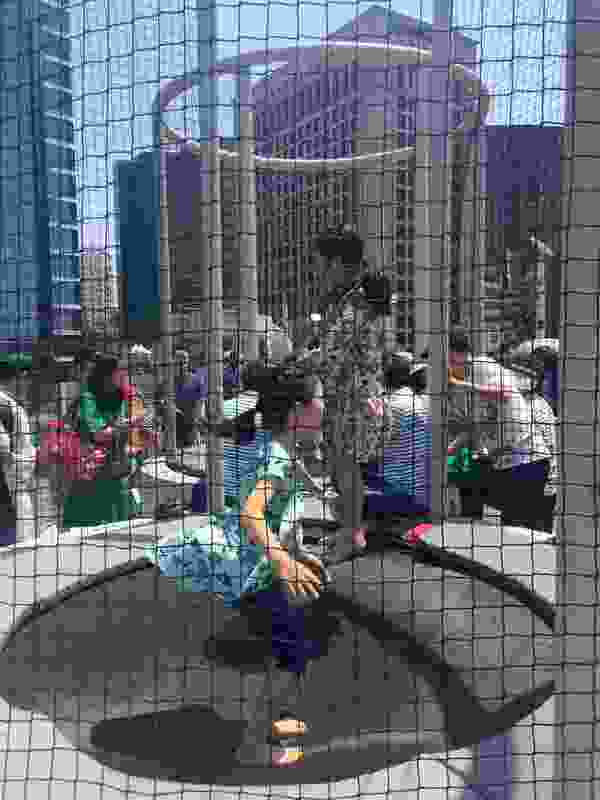 Children enjoy the enclosed public trampolines. Some planters contain rock and plant arrangements, much like open terrariums. Plant species are signposted on each planter.